Some while back, Simon Gladdish published a rhyming version of the Rubaiyat of Omar Khayyam, based on the 1967 version produced by Robert Graves – see https://omarkhayyamrubaiyat.wordpress.com/2017/11/11/new-version-of-robert-graves-rubaiyat/. In his new book, Simon has worked with another well known version of the poem, that produced by the poet John Heath-Stubbs using the translation made by the Persian scholar Peter Avery. When the work was originally published, Heath-Stubbs’ free verse was criticised by some as being uneven and lacking in lyricism . Simon has now taken the verses and adapted them to a rhymed basis using an ‘abcb’ format. For those who don’t know it, the Avery/Heath-Stubbs book was first published by Allen Lane in 1979. The 235 quatrains that they translated and then versified were chosen based on the work of the Persian writer Sadiq Hedayat, supplemented by that of Muhammad Ali Furughi and Qasim Ghani. These Persian experts had previously selected from the Persian verses attributed to Omar Khayyam those that they deemed most likely to be authentic. The 1979 book contains an interesting introduction by Peter Avery, discussing the period in which the historical Omar Khayyam lived and aspects of the beliefs and poetry of the time. 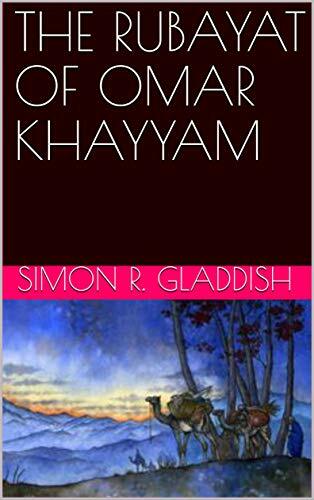 Simon Gladdish’s book is entitled The Rubaiyat of Omar Khayyam by Simon R Gladdish and John Heath-Stubbs. It is available on amazon.co.uk as a paperback at £4.50 and for Kindle at £1.99. The two versions have different covers – both are shown here. The paperback has a naked woman and the Kindle a camel. We are not quite sure of the significance of this difference. Perhaps Simon can explain? Much appreciated are OKR’s continuing updates. I was glad to see that you mention the excellent introduction to Avery/Heath-Stubbs’ translation. And while I’m at it, many thanks for the Aminrezavi lecture. And long overdue, my thanks to Sandra and Bill for their account of the Ouseley brothers’ journey to Persia in the early nineteenth century: well-documented and interesting reading. Thanks for your comments Barney. We are glad the blog posts are useful. Beauty & The Beast of Burden – the answer to the question perhaps ? A thousand thank yous once again! I am absolutely delighted that you appreciate my rhyming version of John Heath-Stubbs’ Rubaiyat and I hope that many others will come to appreciate it too. As for the covers, I simply downloaded some Rubaiyat pictures from the internet and selected those that I preferred. There might have been some kind of subconscious connection between the camel and the naked woman. Who knows? There was a slight problem with the font size right at the beginning of the (camel covered) Kindle version which Amazon have finally corrected. God knows how many sales I have lost in the meantime!